Lineal heavyweight champion Tyson Fury 27-0-1 (19) wants to have a homecoming fight in Manchester in April before rematching WBC heavyweight champion Deontay Wilder 40-0-1 (39) later in the year. In the wake of Fury’s controversial draw with Wilder in December the WBC ordered an immediate rematch between the pair. 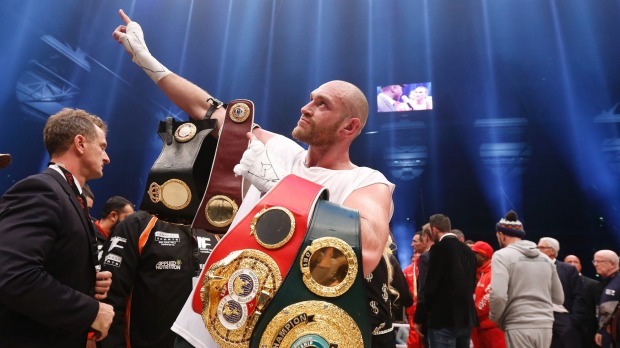 But while negotiations for a rematch in Las Vegas in the summer continue, Fury has revealed plans to squeeze in a fight on home soil before locking horns with the 33-year-old ‘Bronze Bomber’ again. “Hopefully I get a fight with Deontay Wilder in America or England; I’m not bothered where it is,” Fury told BT Sport. “If it’s in Australia or Antarctica it wouldn’t be a problem to me; wherever the fight is, we’ll go. “But I’d like a homecoming fight in April, maybe in Manchester or elsewhere in the UK, and then I’d like to fight Wilder again. But if not the homecoming fight then just Wilder, but if not Wilder then just the homecoming fight. “Whether it happens or not it’s down to them. If they want the fight, they want it; if they don’t, no problem to me. “They need to redeem themselves, not me. I’ve done everything I should have done. I don’t need to redeem myself or a second chance at glory. “I’m the lineal heavyweight champion of the world, I don’t need an alphabet title. “Hopefully there are plenty of exciting nights left in me. I’m still young at 30. I just hope everyone does the right thing and fights each other because if they don’t it’s pretty pointless being involved in the heavyweight division. Meanwhile Fury’s promoter Frank Warren has hit back at claims from Eddie Hearn, who promotes unified heavyweight champion Anthony Joshua 22-0 (21), that there have been discussions about matching AJ with the ‘Gypsy King’ at London’s Wembley Stadium on April 13. “We’re certainly not having any conversations with Anthony Joshua because no one ever contacts us,” said the Queensberry Promotions boss.